Mercedes Benz Key Replacement Made Easy! Have you lost the keys to your favorite luxury car? Is your Mercedes benz stuck in your garage because replacing the keys is way too expensive? We can provide you different methods to replacing the keys to your Mercedes quickly and affordably. 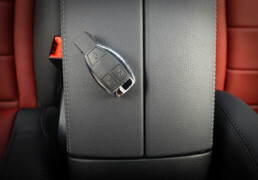 Mercedes was one of the first vehicle manufacturers to introduce electronic keys and security systems built into the car. As such this means that Mercedes are one of the more expensive vehicles to get replacement keys for. ProTech finds the path of least resistance to getting you your new key. Locked out of your Mercedes? Call ProTech Key & Locksmith. ProTech Key & Locksmith is the best of both worlds. Not only are we able to come to you to fix your car (really important if you’ve lost both keys) but we specialize in Mercedes Benz models and can get you back on the road in just a few hours! Our locksmiths can often supply, cut and code the key for your car and they can do it all at once. Our mobile locksmith, who works with your specific model, will discuss your needs beforehand and they will get you on the road quickly and smoothly.